Enjoy this fun and innovative way to exercise from the comfort of your own home, now with the luxury of your own personal trainer. 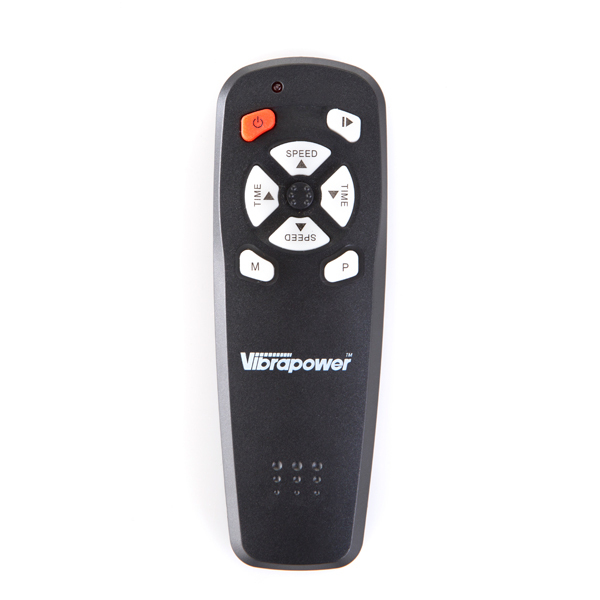 This is our latest version of the Vibrapower, our first ever Vibrapower with detachable mast, touch screen monitor and has the unique Voice Coach. It also features a calorie counter showing you exactly the amount of calories you've burnt during your workout, pulse sensors and a series of built-in programmes to help you get the results you desire. Once you select the workout you want to do, whether it's Upper Body, Ab Blast, Leg Workout, Full Body, Cardio or HIIT, the voice coach will talk you through each exercise whilst counting you in and also counting you down, or decide your own workout with up to 20 settings in manual mode. Supercharge your workout with the attachable resistance bands that can be attached in three different locations, providing greater progression and variety for a lifetime of enjoyment. The unit will work with or without the detachable mast and the Touch Screen Monitor allows you to control/select between 6 tailored programmes plus the different levels of manual mode. The monitor will count calories, heart rate, time, speed. The detachable mast and built-in wheels means it's easy to move and easy to store. Built as an oscillating platform with 20 levels of speed and 6 pre-set tailored programs, you can benefit from Vibration training and get an intense workout in just ten minutes by using the resistance bands to enhance your workout. Perfect for those who want help pursuing their goals in muscle building, general fitness, endurance and muscle relaxation. 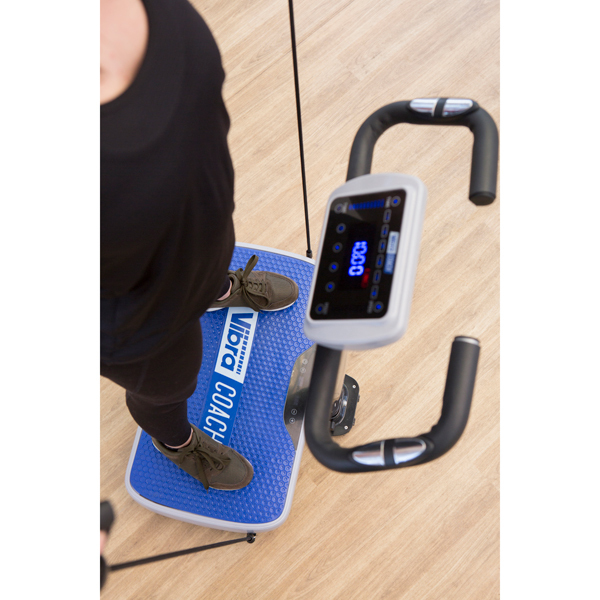 Join the next generation of fitness technology; the Vibrapower Coach platform produces an oscillating motion rather than a solely vertical vibration. The key difference between oscillation vibration and piston vibration is that with piston vibration, both legs are simultaneously moving upwards or downwards, but with oscillation vibration, one leg is moving up while the other is moving downwards and can be compared to the action of a see-saw. 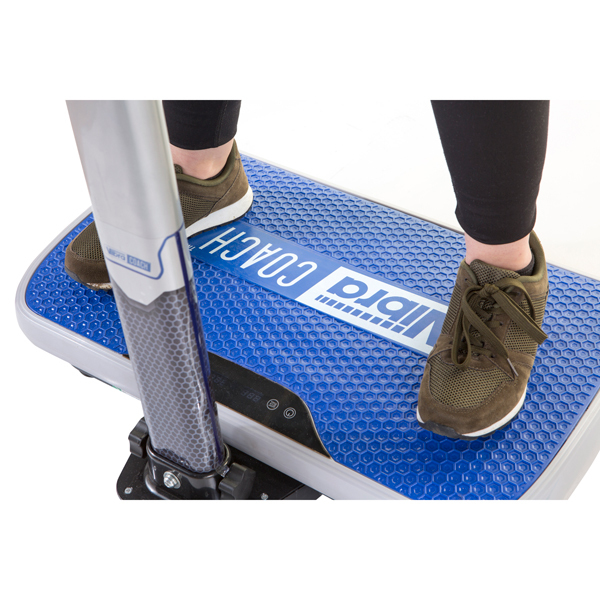 The platform tilts from side to side over a central fulcrum, lifting one side of your body while at the same time dropping (displacing) the other side. This pattern is switched to and fro at a frequency set on the control panel. 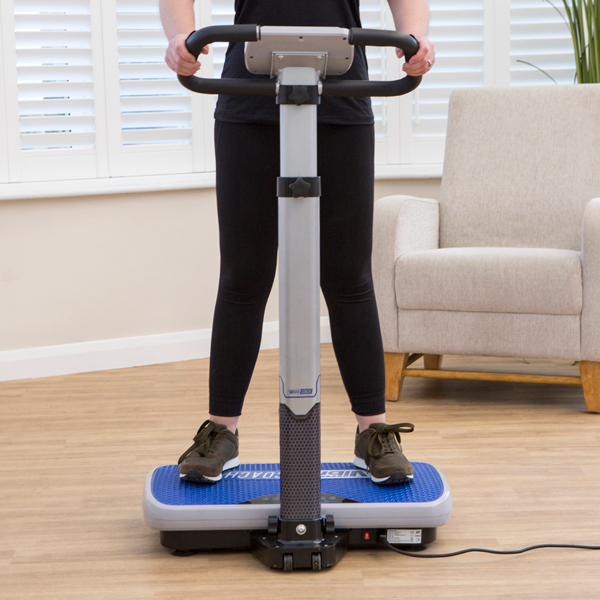 Using a vibration machine like the Vibrapower Coach may provide benefits to your normal routine, it helps you to exercise in a different way, just stand on the oscillating plate and do your basic exercises like squats, press ups etc. 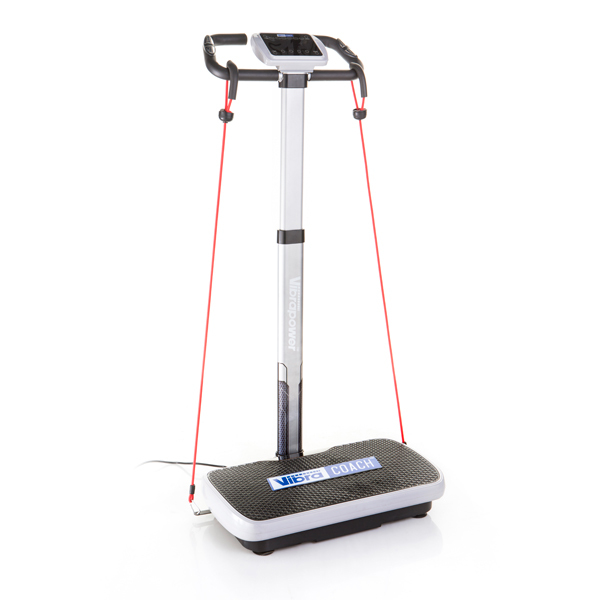 Whereas between 40 and 60% of a muscle's fibres are recruited to perform free-weight or resistance machine exercising, performing similar exercises on a vibration plate like the Vibrapower Coach uses almost 100% of the target muscles fibres. This is achieved by creating an almost constant state of reflex in the muscles, known as a tonic stretch/reflex. This means that the muscles are flexing and contracting at a very high frequency producing faster increases in muscular strength. Six tailored programmes and a manual mode 20 different speed settings - maximum user weight 120kg / 18st 12lb. The Vibrapower coach has a bigger surface that allows you to exercise more comfortably with a great and modern design. Roller on the front for easier transport. 2 x sets of resistance bands are included to enhance your exercises. These can be attached at 3 different locations on the unit so you can get a greater variety of exercises. 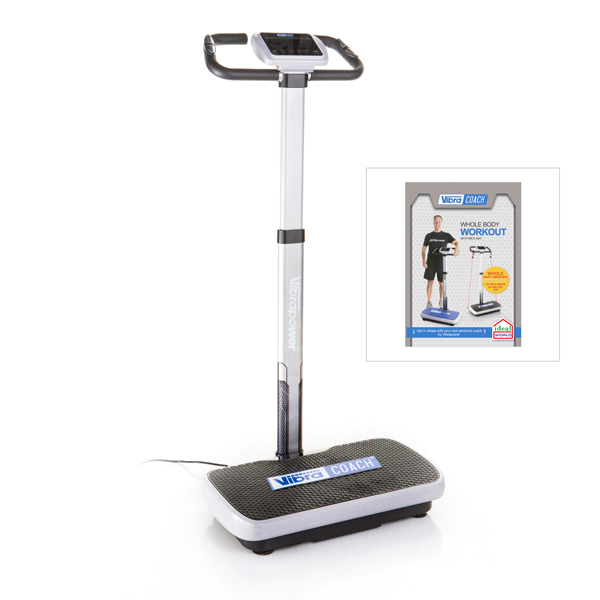 When the mast isn't attached you will have a remote control which will help you control the programmes and the speed without the need of reaching the control panel, you can take control of workout without having to bend down. Easy to store as the mast is detachable. 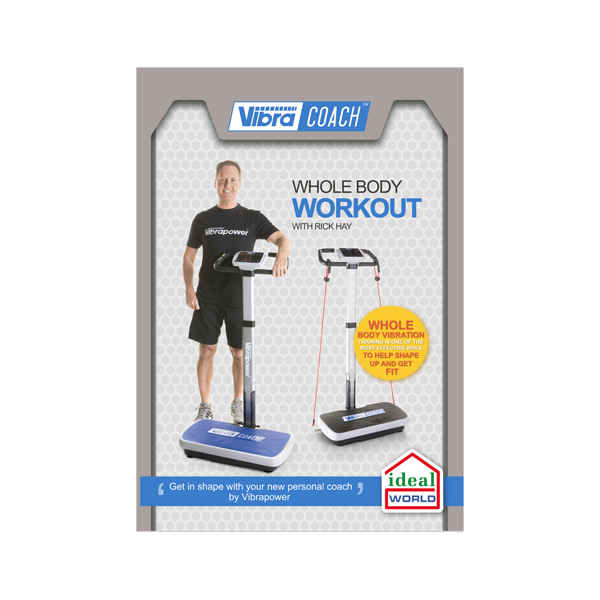 This DVD is the perfect addition to make the most out of your Vibrapower Coach. It will teach you how to do each exercise whilst also showing you how to develop further and get the most out of your machine. Your Vibrapower Coach DVD takes you through 6 guided specific workouts. Each workout shows Beginner, Intermediate and Advance so it caters for all levels of fitness and will help you develop further - so no matter what your fitness level there's a workout for you. The DVD follows the specific programmes built into the Coach, teaching you the correct form of each individual move whilst also showing you the beginner, intermediate and advance alternatives. The exercises have been designed to help shape all your body muscles and help you improve your general fitness. There is also an instructed warm up and cool down section focusing on some key stretches and gentle Yoga and Pilates moves. 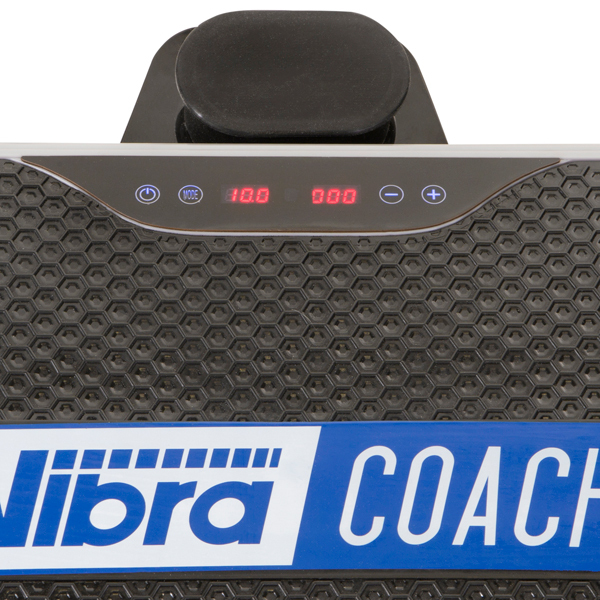 Click here to download the Vibrapower Coach user guide. Discontinue using if you experience dizziness, nausea, shortness of breath, pain, or any other abnormal symptoms. Consult your doctor before beginning this or any exercise or diet programme. Follow the warm-up exercises before you commence your workout. Increase speed, intensity and duration of exercises gradually. Vibrapower Coach is NOT suitable for use by children. Do not jump on the plate as this may cause damage. After each use, the machine must always be switched off and unplugged. Always switch off the machine and disconnect the power supply before cleaning. Do not let the Vibrapower Coach get wet with any type of liquid. In addition, do not use the Vibrapower Coach while your hands are wet. 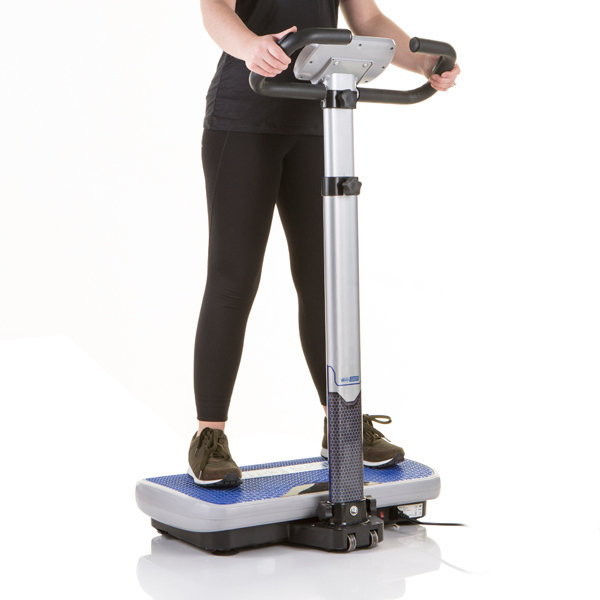 Only use the Vibrapower Coach on a surface that will not be dented or damaged by the weight of the machine. 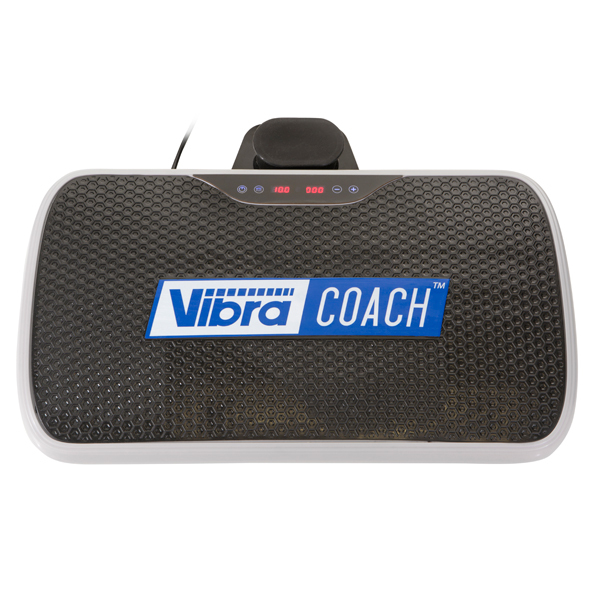 Place the Vibrapower Coach on an old cloth or training mat before use, to avoid marking the floor or carpet. Only one person is allowed to use the machine at any time. Keep your fingers away from the edge of the footplate while the machine is in use. For comfort, before first use, make sure there is enough space around you (at least 1 metre). 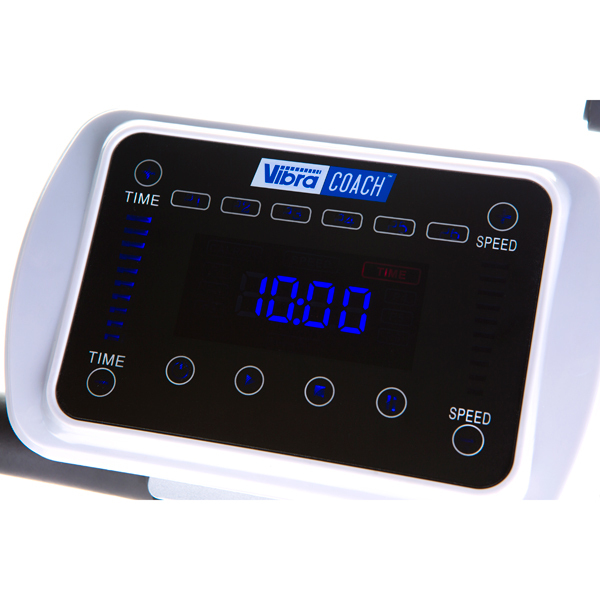 The voltage and electrical circuit to which the Vibrapower Coach is connected must always comply with the laws in force. This appliance is not intended for use by persons with reduced physical, sensory or mental capabilities, or lack of experience and knowledge, unless they have been given supervision or instruction concerning the use of the appliance by a person responsible for their safety. Children should be supervised so that they do not play with the appliance.